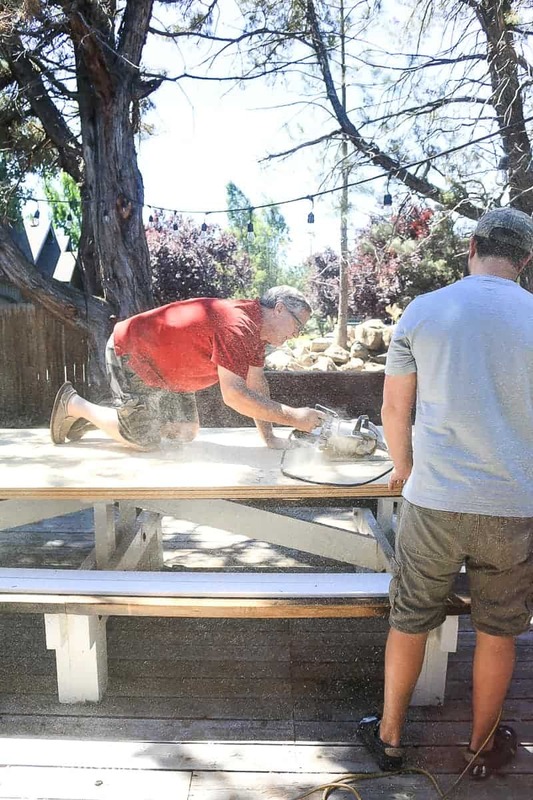 Looking for a fun weekend project that you can start and finish in just a few hours? 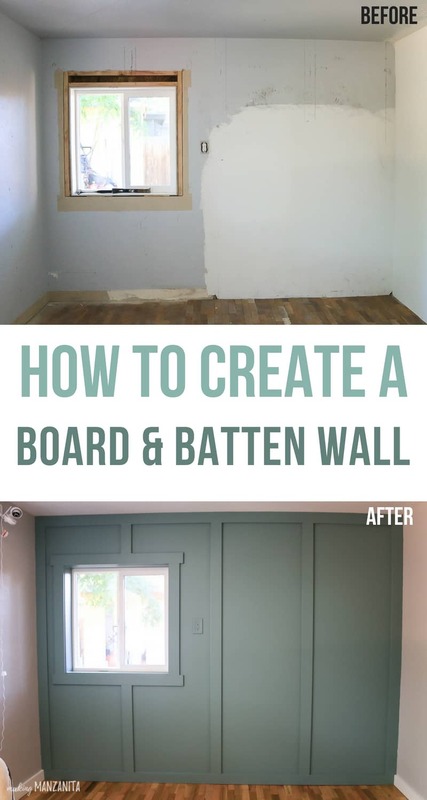 Create an accent wall of board and batten! 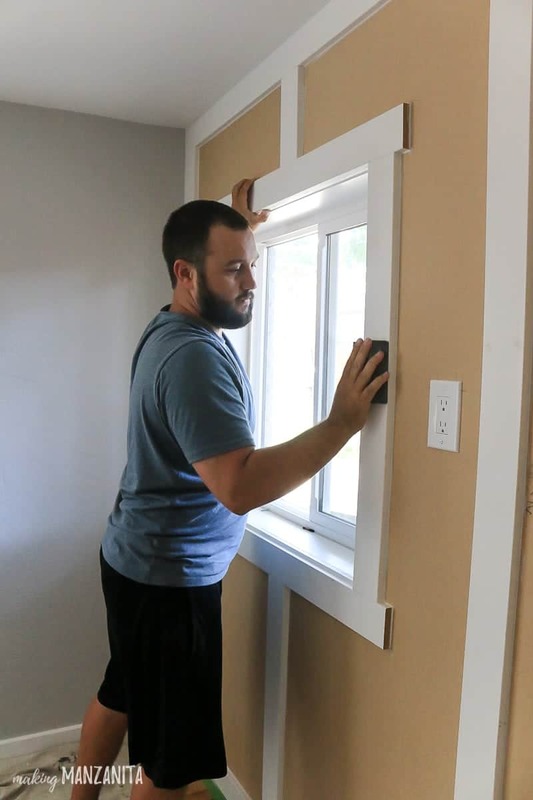 This tutorial of how to install board and batten wall makes it so simple! I even show you an easy way to add board and batten on textured walls. When I was planning the design of our modern farmhouse nursery, I knew I wanted to add an accent wall of some sort. You guys know how much I love shiplap. We’ve installed a faux shiplap wall in our bathroom and made a plywood shiplap wall in our living room at our last house. I considered doing shiplap in the nursery, but wanted to try something new. So I decided on adding board and batten! I absolutely love how the feature wall turned out. It adds so much to the room! 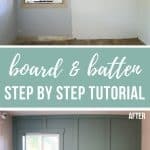 I can’t wait to show you just how easy it was to add board and batten in this simple tutorial! What is board and batten? Board and batten is a wood wall treatment that can be applied to interior or exterior walls. 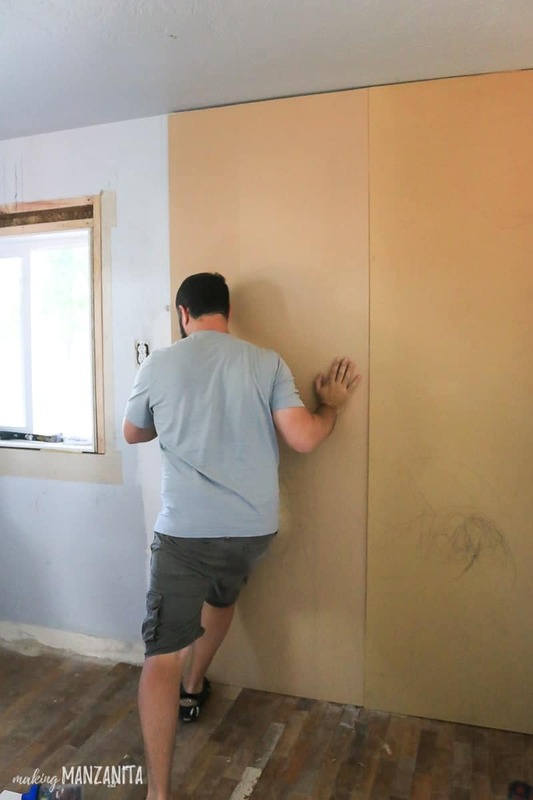 The “board” is a smooth board that is applied to the wall first. The “batten” are trim pieces that are added to the top of the boards as decorative accent. The batten pieces are usually vertical and sometimes have horizontal pieces added too. Can you do board and batten on textured walls? 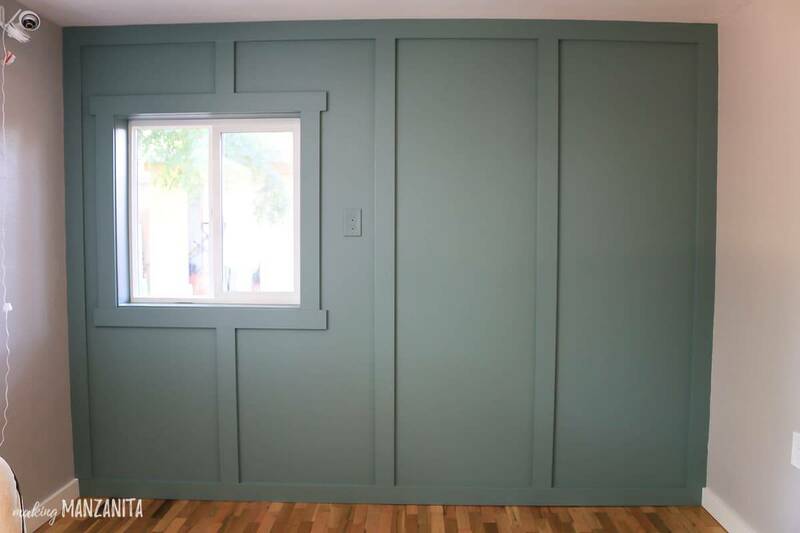 Yes, you absolutely can install board and batten on textured walls. In fact, a “true” board and batten wall involves adding boards directly to the wall for a smooth backing. 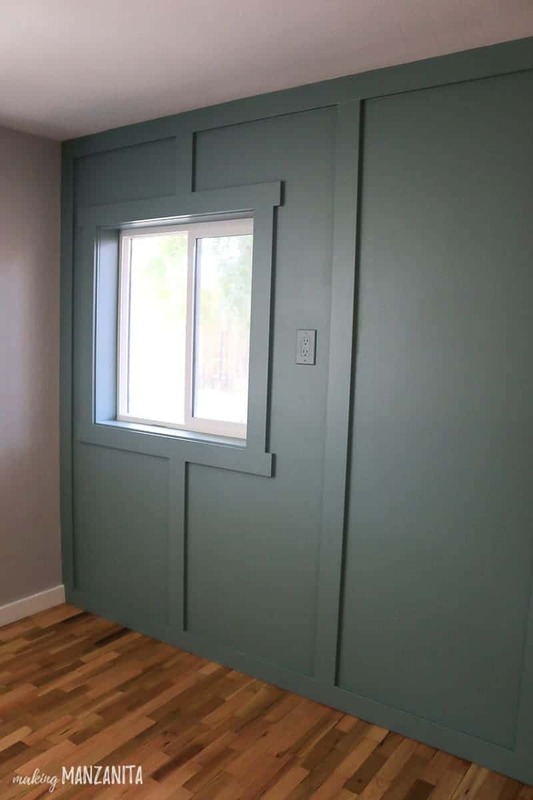 Many of the board and batten tutorials out there show trim pieces added directly to the wall, which is definitely a very inexpensive way to install board and batten! But, that version doesn’t work on walls that are heavily textured or varied backgrounds. 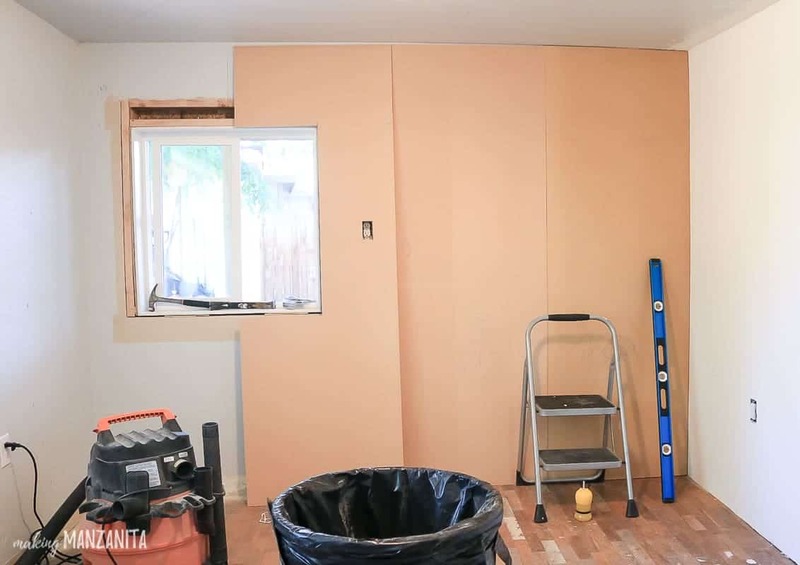 In our case, we had removed a fireplace on the wall where we were adding the board and batten, so there was a large patch. Our walls are also pretty heavily textured, versus something a little more subtle like Orange Peel texturing. 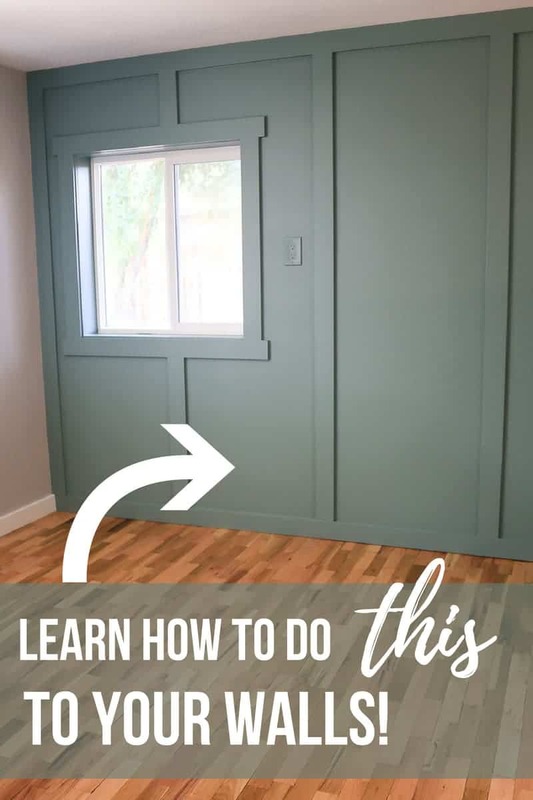 I’m going to show you how easy it is to install board and batten on textured walls. Are you ready to see just how easy it is to install board and batten? Step 1. Plan your board and batten wall. 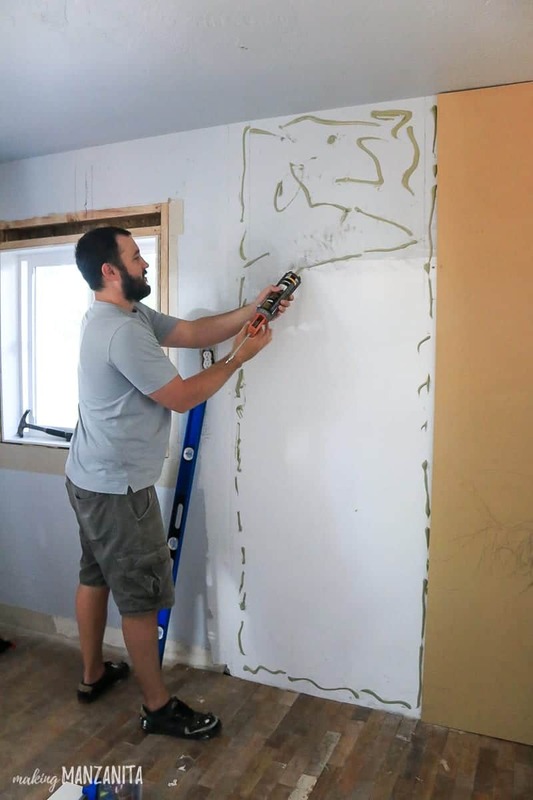 Before you jump right into installing your board and batten wall, you need to grab a tape measure and some pen & paper to plan it out. It is important that the batten pieces (which are the vertical trim pieces that are attached on top of the boards) are evenly spaced, so take the width of your entire wall and divide it by the number of battens you want on the accent wall, which in our case was 5 (which includes the pieces of the right and left corners). If you are wondering how far to space your board and batten, I would recommend something in the range of 12″ to 18″. Our wall is 119 inches wide and we wanted 5 battens, so that means that there will be roughly 23 3/4 inches between each batten (119 ÷ 5 = 23.8). This measurement will be the distance between the battens from the center of batten pieces (which are 3.5″ wide in our case). Step 2. Mark your wall where batten will go. Next, let’s take your plan and mark it all the wall. Remember you need to account for the width of the batten pieces (which are 3.5″ wide), so starting from one corner, make a mark 1.75″ from the corner. This mark is the center of the first batten piece. From that mark, measure and make a second mark at whatever the distance is supposed to be between your batten pieces. Continue this all the way across your wall until you get to the other corner. If your math is right, your last mark should be 1.75″ from the far corner. Next, you will draw in the actual lines where the batten pieces will go. On each side of your marks, make two lines – both 1.75″ from the mark. Again, this is to account for the width of your batten pieces, which are 3.5” wide. Take a step back now and look at your board and batten wall design. Does it look right to you? Do the batten pieces line up poorly on your wall with any outlets or window trim? You definitely want to plan ahead to avoid those. If needed, adjust the number of batten pieces on your wall to avoid outlets or trim pieces. Step 3. 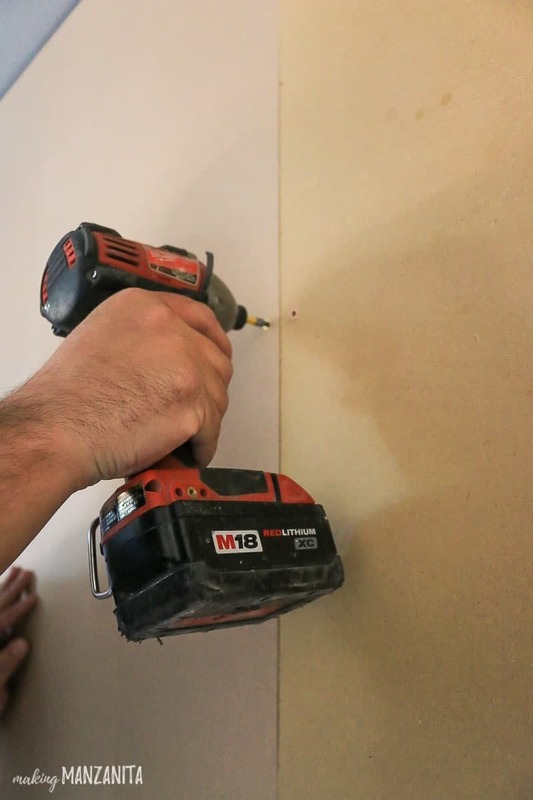 Cut your MDF panels down to size. 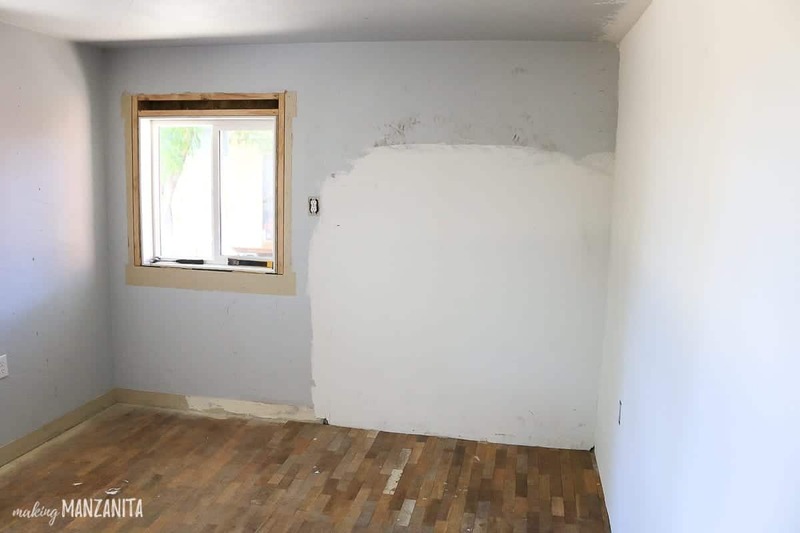 Now that you’ve got your plan drawn on the wall, it’s time to cut the boards down to size. 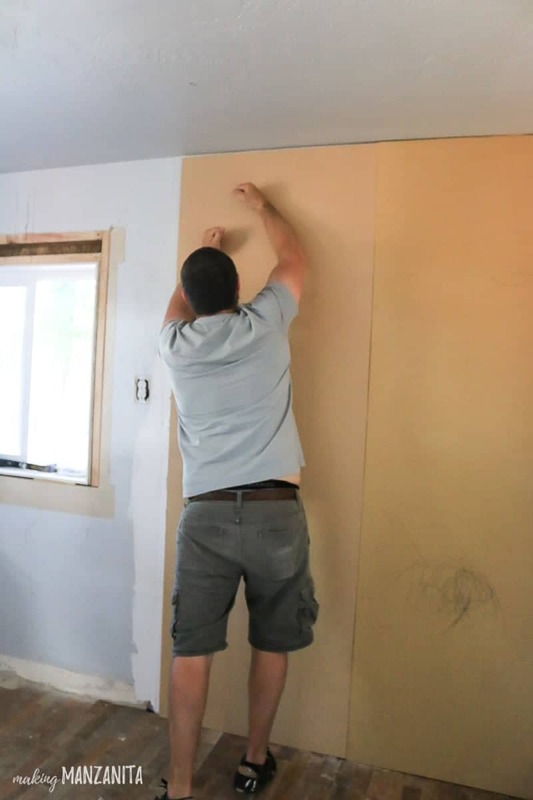 The boards will provide a smooth back to your accent wall, which is necessary if you are installing the board and batten on textured walls. Step 4. Glue boards to wall. 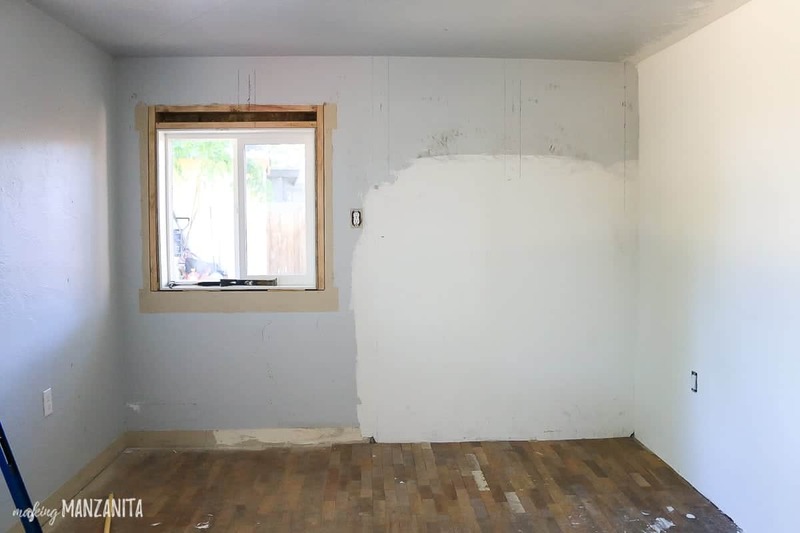 Next you will glue your boards to the wall with construction adhesive. This is where the DAP Beats the Nail All-Purpose Construction Adhesive comes into play with its quick-grab formula. 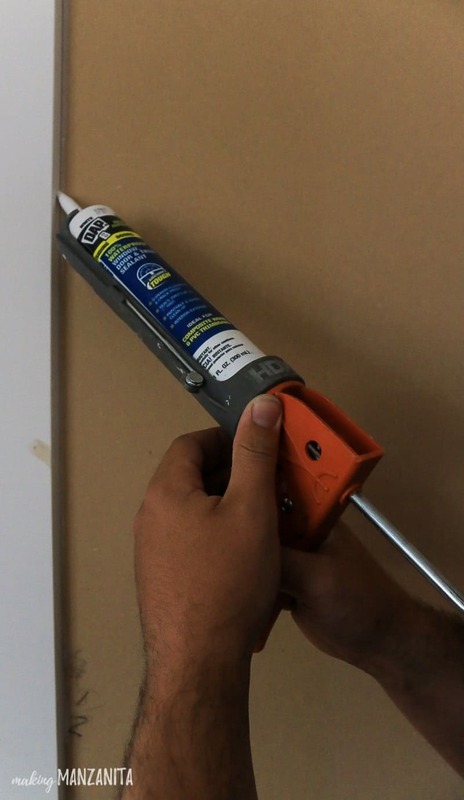 Put the adhesive in a caulking gun and generously apply to the wall. Then, lift your MDF panels up and onto the wall and press all over. We added a couple screws in a few places on the MDF panels, but did not nail or screw the panels to the wall all over. This is because our walls were uneven and had some high spots and we wanted the boards to be flat. When adding your batten pieces, start with the top and bottom pieces and then the right and left corners so you essentially have a box around the board and batten wall. Again, apply more construction adhesive to the back of the batten pieces and press on to the wall. Be sure to check that you are level as you go. Follow up by nailing the batten pieces in place with a brad nailer and 1 1/4″ nails. Step 6. Caulk seams on board and batten wall. 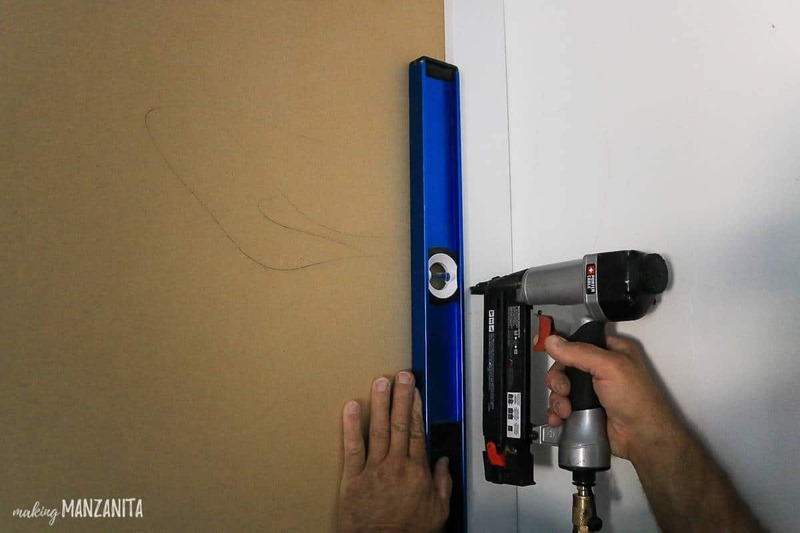 Now you can begin caulking to cover the seams and cracks of the wall with DAP Dynaflex 230 Premium Indoor/Outdoor Sealant. If there any gaps between your boards and window trim, you can also fill them with caulk. 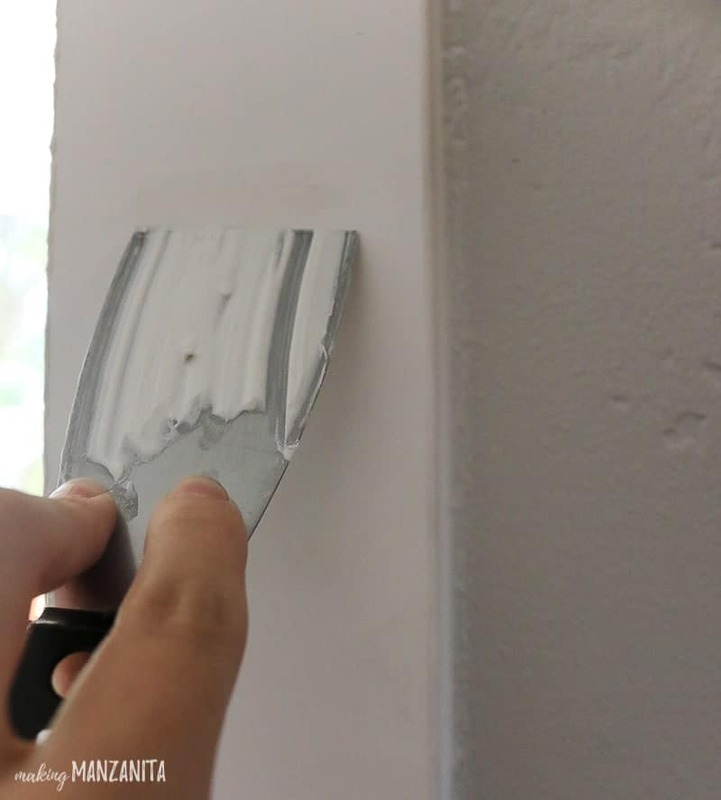 Apply the caulk in a small bead on any seams of the wall and then press them in with your finger. Step 7. Patch & sand nail holes. While the caulk is drying, you can start patching nail holes in the batten with DAP Alex Plus Spackling by using a putty knife. Follow up with lightly sanding any places you patches. 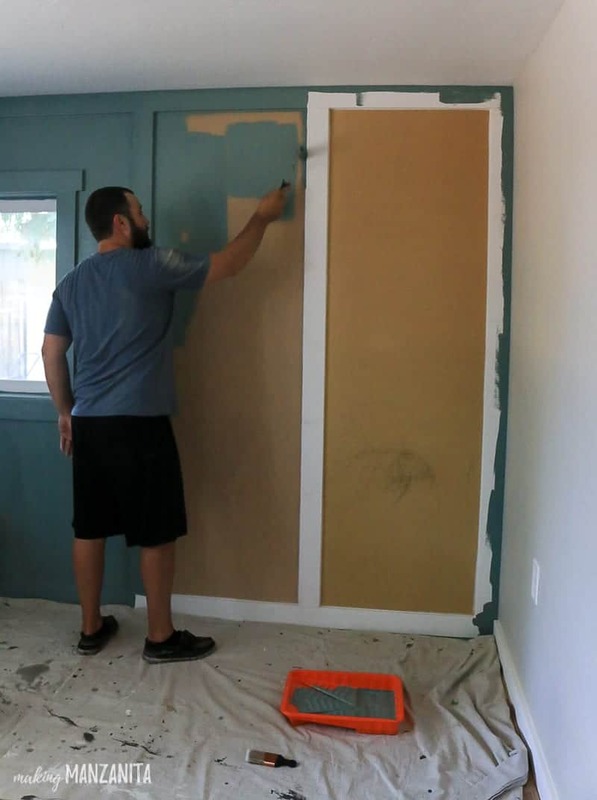 You want the trim to be silky smooth before painting. Step 8. Paint board and batten wall. Finish off by painting the board and batten wall. We always use a high quality paint that has a primer in it, but if you’re not using a paint + primer, be sure you prime first. We had this gorgeous leftover paint from this project of painting our front door. 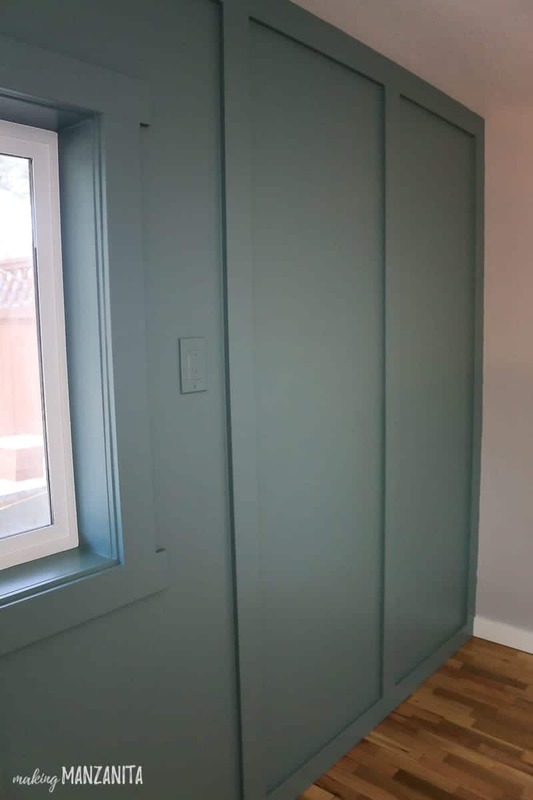 It’s the perfect color (which is ‘In The Moment’ by Behr if you’re wondering) that I fell in love with and influenced the design inspiration for our modern farmhouse nursery. Further reading – If you’re doing any interior painting, you’ve gotta read this post full of interior painting tips! We used this small paint roller, which was great because we could easily roll the paint onto the edges of the board pieces and didn’t have to use a paint brush. We only used a brush when cutting in on the edges of the board and batten wall. This board and batten wall was so easy to install and add so much character to our nursery. 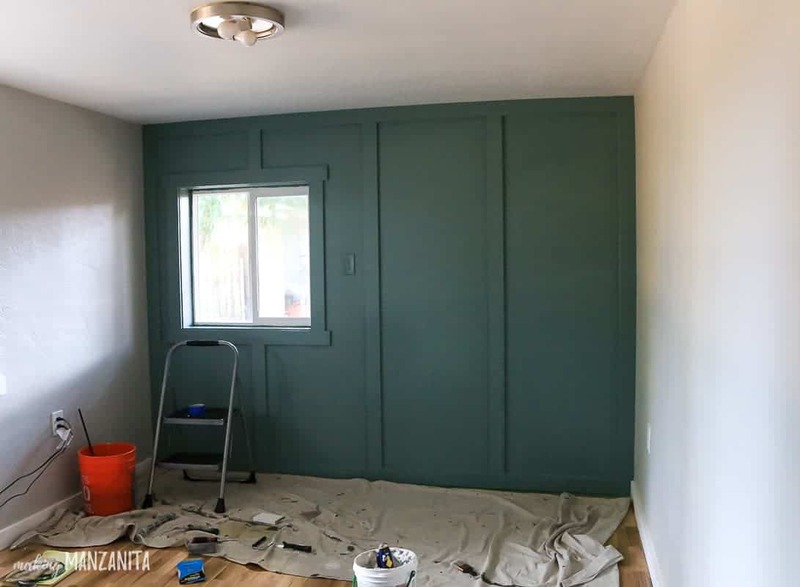 You can easily transform a room in your home in just a couple hours by adding an accent wall treated with board and batten. And I really think the look of board and batten is so timeless and works with many different styles! Where would you install a board and batten wall in your home?? Let me know know the comments below! 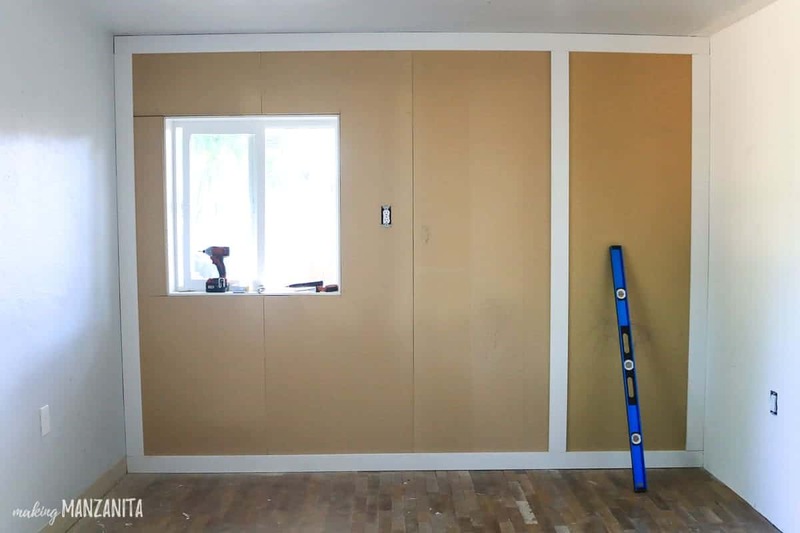 How To Install A Board and Batten Wall – you are here! Great tutorial and beautiful result! Looking forward to checking out more of your posts… Question – did you paint right over the electrical plug? I love how it blends in and isn’t an eyesore! Will be sharing this on Pinterest. It looks great and is such a quick, easy and cheap solution, especially when plugs are higher up – will definitely be using this idea! Thinking about adding board and batten wall in our bedroom after seeing how well yours turned out. Thanks again! You should go for it, Denise! 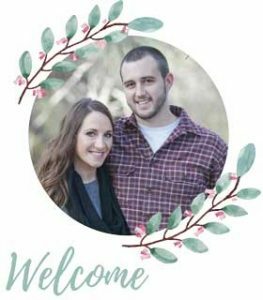 It was such a fun and easy project and made a huge difference. If you do give it a try, be sure to come back and share a photo or let us know how it goes!